Calia Italia Cannes power reclining cinema sofa hand made in southern Italy. Uphostered in amazing thick Italian protecta leather . Absoltuely stunning and modern would enhance the look of any room. Ideal for cinema rooms, comes with bendable touch control LED lights and lift top storage. All the seats are power recliners and power headrests. Avaliable in many colours, 8 weeks in choice of your colour. 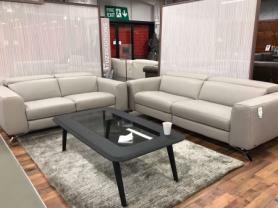 We are selling our display model in full Italian category 15 Espresso leather at a massive discount. Approximate Measurements: L: 350 cm. D: 103 cm.